Captain Tilmann Gabriel, Director of the MSc Air Transport/Aircraft Maintenance Management programmes, will be speaking about pilot training on 9th March 2016. 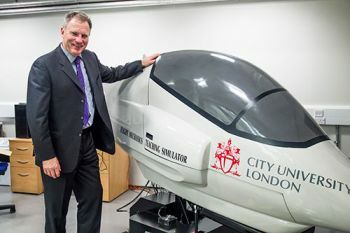 Captain Tilmann Gabriel, Director of City University London’s MSc Air Transport/Aircraft Maintenance Management programmes, is one of the featured speakers at the European Corporate Aviation Summit on 9th March, organised by the Aeropodium at the Hill Dickinson LLP in London. The conference will encompass recent developments in corporate aviation and new opportunities and challenges in the sector. Captain Gabriel, former Executive at Qatar Airways, British Airways and Lufthansa, is currently carrying out research into pilot training and has been investigating the human aspects of pilot cockpit interactions with the technology built into the aircraft operating envelope. The continuing decline in oil prices and the demand for private and secure air transport is expected to augur in favour of the expansion of global business aircraft solutions. That said, Captain Gabriel is concerned about the readiness of sufficient quantities of young candidates for pilot training in an aviation industry requiring a substantial volume of pilots, with each cockpit featuring highly advanced avionics: "We really need to be paying attention to a digitally savvy, millennial generation who are accustomed to creative interaction with gadgets and smartphones who are asked to adapt to a cockpit requiring them to constantly observe vital digitally displayed information, which they will not be interacting with in the same way. Perhaps the time has come to build gamification into pilot training and daily cockpit work."